When did 'dunking' suddenly become a fashion statement . . . ? Friends and colleagues of mine have just returned to New Zealand from a three week tour of Italy - one is an artist the other a musician. Besides the copious amounts of retail therapy that went on, they spent most of their time feasting their eyes on all that tremendous art and history . . . would you believe the most historic building in New Zealand is just 150 years old! Being avid 'foodies', they also feasted on and brought back tales of all the great foods they tried, the fresh produce, the sitting on the sidewalk and enjoying glasses of wine, great coffee and splurging on the fantastic European desserts, cakes, gateau and of course the obligatory biscotti. Do you remember as a child your parents screaming at you for dunking your biscuits? Or were you allowed but always had the biscuit drop off into tea or coffee and if you were allowed I bet it wasn't done when that posh, great auntie came for a visit? Who would have thought this 'behind closed doors' indulgement, this 'well granpa does it' habit, would now come out of the closet and be fashionable? This wondrous hard Italian biscuit (recipes for them exist from the as far back as the Thiteenth century) just calls out for being dunked in your latte, to soak up those aromatic Italian coffees and to soften them enough so you do not break your teeth. Why are they so hard? and that is also what and how the word biscuit got its name, but from the French. Cuit being French for cooked also. It is actually plural: biscotto meaning one. I am sure you have tried Biscotti and like me I am sure you have been stung by their often over inflated price that some coffee shops charge for the small slice that they serve you. When you get that craving, why not make your own? Below is a recipe for the basic biscotti followed by ingredients for variations on the theme. 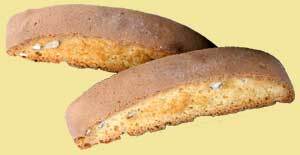 Biscotti until very recently were mostly the traditional hazelnut flavoured with a touch of aniseed. But chefs being chefs took the basic, the traditional and are now producing all manner of flavours, with all manner of creative additions and that is what cooking is all about. For the most part the method of production would be the same no matter what ingredients are used. Using my recipes as a template I am sure you will soon be adding your own favourite nuts, flavouring etc. Join in the following weeks for a 'buffet' of my other favourite Italian dishes . . . well I am a Welshman and we did just trounce them at the soccer, so I have to give something back! But until then, buon appetito and ciao bella / bello . . . ! They may be dusted with icing sugar or cocoa just prior to serving, or if you have the time try streaking them with piped chocolate or half dipping them in melted chocolate.